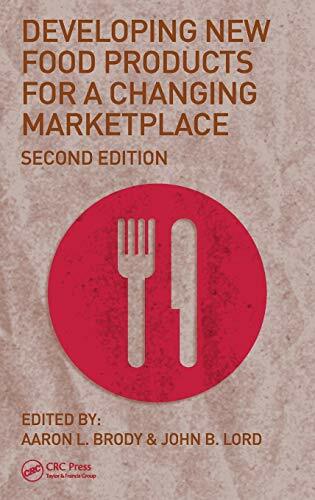 [PDF] Developing New Food Products for a Changing Marketplace, Second Edition | Free eBooks Download - EBOOKEE! Description: Far exceeding the dynamic evolution prophesized by the editors of the first edition, food product development outstripped all expectations by incorporating several new phenomena. The demands of aging boomers for food that provides both taste and nutrition, the overwhelming consumer demand for convenience, the rapidly changing landscape of food retailing, and scientific breakthroughs in ingredient, processing, and packaging technology underscore the industryâ€™s propensity for change in the marketing, packaging, and development arenas. Such drastic change demands an up-to-date review of this expanding field. Navigate a Changeable Landscape Driven by the recognition of the interdisciplinary philosophies that underlie this dimensionally volatile landscape, the editors and contributors of Developing New Food Products for a Changing Marketplace hardwire their vision of holistic food product developmentin their breakthroughsecond edition. World class authorities, seven of whom are Institute of Food Technologists (IFT) Fellows, present the economic, functional, and novel reasons for developing new products. They go on to discuss formulation, sensory and consumer testing, package design, commercial production and, ultimately, product launch and marketing. Meet the Demands of a Consumer Driven Market Continuing to offer the up-to-the-minute information that made the widely adopted first edition so popular, the second edition introduces new concepts in staffing, identifying and measuring consumer desires, engineering scale-up from the kitchen, lab, or pilot plant and generating product concepts. Applying insights from real life experience, contributors further probe the retail environment. They cover optimization, sensory analysis, package design, and the increasingly important role of the research chef or culinologistâ„¢ in providing the basic recipe. No comments for "[PDF] Developing New Food Products for a Changing Marketplace, Second Edition".